7/1 Deadline of abstract submission is extended to 7 AUGUST, 2015 Now it's closed! Please kindly be advised that deadline of registration will not extend from 7 AUGUST, 2015. We expect that accommodations near the venue will be booked so fast because Tokyo has become very popular for travellers and the conference dates are best periods for sightseeing. Therefore, we kindly recommend early registration and booking of flights and accommodations (see link to Registration Form). 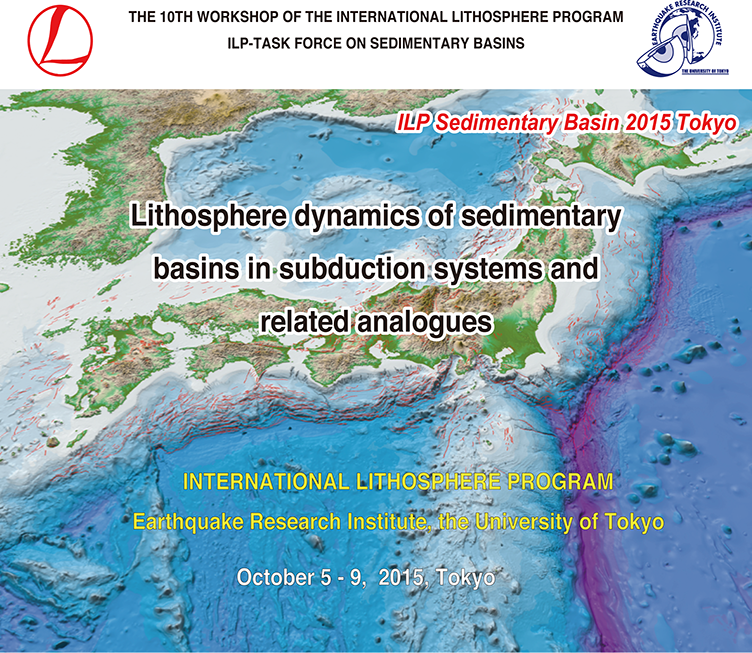 Please send this MS word registration form to ilp2015_apply at eri.u-tokyo.ac.jp. Within couple of days ”Payment Instruction” email from TOKYO EXPRESS INTERNATIONAL will be sent, so please follow instructions to payment for registration fees via credit card. Registration process is complete when you receive “Your Order Confirmation” email. The Izu-Bonin arc on the Philippine sea plate is now colliding against the Honshu arc on the Eurasian plate, forming the Izu Collision Zone 80 km west of Tokyo. We can observe the fore-arc basin fill sequence uplifted by the collision at Miura peninsula and strongly deformed trench-basin-fill in Ashigara area. A bus tour to the middle of Mt. Fuji will also be included. INPEX Corporation, JAPEX, JX., Mitsubishi Corporation Exproration Co., Ltd., MOECO, JGI., Inc., Geosys, Inc. Copyright 2015 ERI, The University of Tokyo All rights reserved.